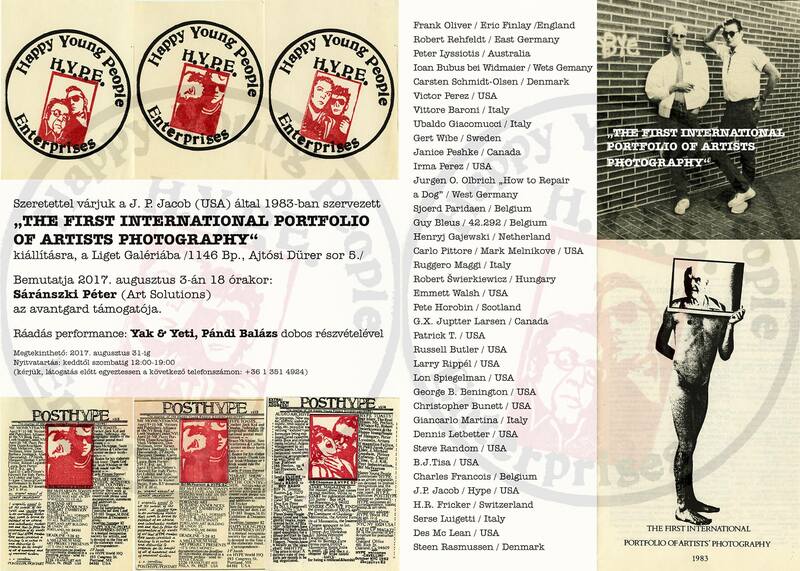 The International Portfolio of Artists Photography was an assembling book project conceived to integrate mail art, book art, and photography. I invited contributors to submit seventy-five copies of an original photograph, which were assembled into books. Contributions were solicited through the mail art community, in particular Judith Hoffberg's Umbrella magazine. The First Portfolio included works by thirty-seven artists from fourteen nations, bound into a tri-fold muslin folio. Two sets of prints were used to create exhibition copies that traveled to venues in Europe, Asia, and in the US during 1983 and '84. The “Notes” accompanying it announced the project as a ten-year effort, with subsequent volumes to focus on photography from specific geographical regions. The Second Portfolio would focus on the Soviet Bloc countries of Eastern Europe; the Third on South America; the Fourth on Asia; and the Fifth, like the First, would be "open to artists throughout the world." Only the First Portfolio was completed. The impetus to devote The Second Portfolio to Eastern Europe arose from problems encountered during the making of the First. Three artists from the region participated in that volume: Robert Rehfeldt from East Germany, Robert Swierkewicz from Hungary, and Waclaw Ropiecki from Poland. Rehfeldt, a graphic designer and illustrator, was prohibited by East German law from making multiples without authorization, therefore he submitted a negative which I printed for him. Ropiecki's submission disappeared in the mail, a common form of state censorship. Only Swierkewicz, working under the somewhat less repressive cultural laws of 1980s Hungary, succeeded in submitting materials as required by the invitation to participate. Through correspondence with these three, as well as addresses shared by mail artists Volker Hamann and Henryk Gajewski, I expanded my list of contacts in East Germany, Hungary, and Poland. From addresses shared by collector Jean Brown and emigre artists Rimma and Valeriy Gerlovin, I made contact with artists in Czechoslovakia and the Soviet Union. Taking advantage of an already vital mail art network in Eastern Europe, each invitee was asked to share the invitation with other artists, and the map of potential participants expanded to include Bulgaria and Romania. Participants were asked to mail a negative or photograph in an ordinary envelope, which I would reproduce for the Second Portfolio. Following my participation in the International Day Art exhibition, Liget Galeria director Tibor Varnagy proposed an exhibition of the Second Portfolio in Budapest. Noting that it would be difficult, and possibly illegal, for such an exhibition to be locally organized, Varnagy invited me to transport and present the Second Portfolio as my personal collection. The exhibition opened in May, 1986. Due to the volume of the material submitted, a second exhibition venue, the Galeria 11, was required to present it all. The Second Portfolio exhibition included works by seventy-five artists from throughout Eastern Europe, one from the Soviet Union, and two Soviet emigre artists living in the US. The exhibition catalog, xerox-printed with a six-page gatefold of photographs by Polish artist Jozef Robakowski, contained an essay by Hungarian photographer Laszlo Lugosi-Lugo, and a co-authored text by Varnagy and me. An address list of participants was mailed separately from the catalog by Varnagy. The exhibition documented the existence of a parallel culture of photo-based artists working within Eastern Europe while contributing to the awareness of a small but vital network of semi-official organizations committed to presenting such work. First Portfolio Participants: Vittore Baroni (Italy); George B. Benington (US); Guy Bleus (Belgium); Christopher Burnett (US); Russell Butler (US); Charles Francois (Belgium); H.R. Fricker (Switzerland); Henryk Gajewski (Netherlands); Ubaldo Giacomucci (Italy); Pete Horobin (Scotland); G.X. Jupitter Larsen (Canada); Dennis Letbetter (US); Serge Luigetti (Italy); Peter Lyssiotis (Australia); Ruggero Maggi (Italy); Giancarlo Martina (Italy); Des McLean (US); Jurgen Olbrich (West Germany) Frank Oliver/Eric Finlay (UK); Sjoerd Paridaen (Belgium); Irma Perez (US); Victor Perez (US); Janice Peshke (Canada); Carlo Pittore/Mark Melnicove (US); Steve Random (US); Steen Moller Rasmussen (Denmark); Larry Rippel (US); Robert Rehfeldt (East Germany); Waclaw Ropiecki (Poland (Missing)); Carsten Schmidt-Olsen (Denmark); Lon Spiegelman (US); Robert Swierkewicz (Hungary); Patrick T (US); B.J. Tisa (US); Emmett Walsh (US); Ioan Bunnus bei Widmaier (West Germany); Gert Wibe (Sweden).